Rutabaga (a.k.a. 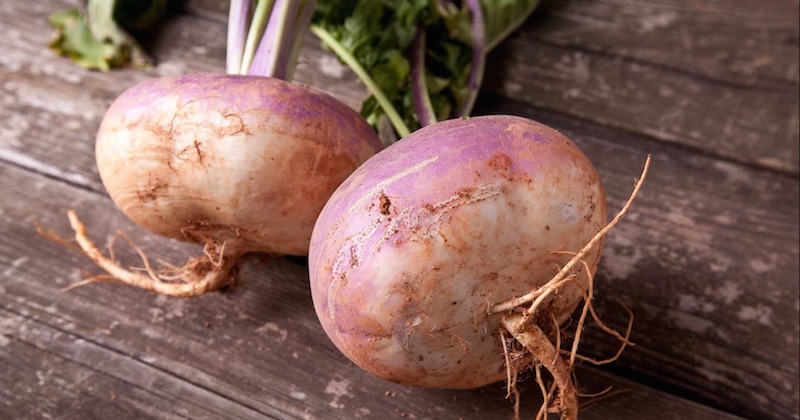 Swede turnip, yellow turnip, or neep) is a root vegetable from the cruciferous vegetable family that might have started from a mixture between a cabbage and the turnip. Rutabaga has a peppery-sweet flavor when it is raw and a much sweeter flavor when cooked properly. Rutabaga contains a high amount of dietary fiber and protein as well as several vitamins and minerals. Rutabaga is rich in B vitamins such as thiamine (B1), riboflavin (B2), niacin (B3), pantothenic acid (B5), folate (B9), vitamin B6 and vitamins A, C, E and K.
It has rich minerals such as calcium, choline, iron, magnesium, manganese, phosphorus, potassium, and zinc. It also contains high amounts of fatty acids such as omega-3 and omega-6 fatty acids in the right proportion. Anti-cancer: Rutabaga provides plenty of vitamin C, potassium, and manganese; it is also a good source of fiber, thiamin, vitamin B6, calcium, magnesium, and phosphorus. All of these combined together provide the body with the power to protect or fight off cancer cells. The phytochemicals in rutabaga can help the body get rid of carcinogens as well as help remove harmful toxins from the liver. Glucosinolate is a particular component that helps prevent cancerous tumors from developing. Bone health: Rutabagas are rich in several important minerals which are crucial for the creation and maintenance of bone tissues, such calcium, magnesium, phosphorus, and zinc. Consuming rutabaga can help lower your risk of the common age-related disorder called osteoporosis. Diabetes: You can use rutabaga in place of potatoes. They are not as starchy as potatoes and are suitable to be added in a diabetic diet. The bulk it provides could essentially even be beneficial for individuals with type 2 diabetes, in lowering their blood sugar levels. Digestion: Rutabaga has a very high content of fiber that helps improve digestion by bulking up stool and prevent constipation and gastrointestinal upset. A regular bowel movement is a critical part of overall health and the high fiber helps to make you feel full for longer. Energy: Rutabaga is rich in beta-carotene as well as potassium and manganese which all provide the body with an excellent source of energy. Enzymatic functions: Magnesium and zinc are key components of many enzymatic functions in the body, without which our bodily processes become sluggish, resulting in various ailments and diseases. Rutabagas contain good levels of both magnesium and zinc for this purpose. Heart health: Rutabaga can be used as an excellent source of potassium that helps lower risk of a stroke. Potassium also helps control blood pressure levels by lowering stress and contraction of blood vessels, which allows for easier blood circulation. It increases oxygenation to vital organs and lowers the risk of clots that can cause strokes. Immune system: Rutabagas are very rich in vitamin C that stimulates the immune system to make white blood cells, as well as produce collagen that helps heal skin tissue, muscles and blood vessels. Metabolic function: Rutabaga provides a small amount of protein that may be good news for vegetarians as an alternative to meat protein. Proteins and amino acids are essential to building new cells and are important for proper development, growth, healing, reproduction, and several other bodily processes. Protects cells: Rutabaga has a high content of antioxidants that help boost the immune system and protect body cells from free radicals that can cause harm. Weight loss: A low calorie, nutrient dense food such as rutabaga helps balance weight loss plans. The high fiber content helps metabolism and manage a healthy body weight. Choose rutabaga that is yellowish to tan in color and has a smooth and blemish-free skin, there should not be any wrinkles or shriveling. Rutabaga can be cooked in a variety of different ways: raw, roasted, baked, broiled, a flavor enhancer for soups, raw and thinly sliced in a salad, or used in any dish with root vegetable as an ingredient. Rutabaga is delicious to be juiced with other root vegetables like carrots, beetroot or jicama with a green apple, for a nutrient-dense beverage. Rutabaga can be stored in a sealed plastic bag in the refrigerator for up to 2-3 weeks. Eating rutabaga in excess may cause unwanted gas issues especially with individuals who have kidney problems. If you are allergic to cabbage, turnips or spinach, you may want to avoid eating rutabaga.